MIA offers Japanese Courses for foreign residents who want to study Japanese conversation and interact with local Japanese people. Have a good time with MIA volunteer members and other participants from many different countries. If you want to attend the Japanese course, drop by MIA to sign up. Japanese Courses for foreign residents Let’s enroll in this course! MIA offers three different weekly group activities. While you are enrolled in a selected activity, you can add an optional free one-on-one activity with a private tutor. If you have small children, courses with childcare services are available. MIA nursing volunteers take care of your children while you are in class. 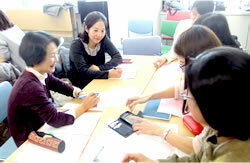 Japanese language beginners can take free one-on-one activities with the course above if they meet the requirement. Those who want to enroll in the course, please come to MIA by two weeks before the course begins to fill out the application form and make necessary payments. Childcare service is available for the Thursday & Friday Courses with prior registration and a fee of \600.